A humanist wedding is a non-religious ceremony to mark a marriage between two people. They are conducted by humanist celebrants and each service is different because the couple write their own vows and script. 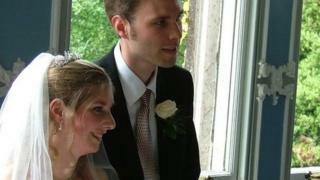 Humanist weddings have been legally recognised in Scotland since 2005 and in the Republic of Ireland since 2012. In last autumn's Budget, the Treasury announced a review into relaxing the rules around wedding venues in England and Wales. The move could bring the law more into line with Scotland, where there is more freedom in where couples can tie the knot. Andrew Copson, chief executive of Humanists UK, said: "These figures show what a good start for couples a humanist wedding can be. "Humanist weddings are deeply personal, with a unique ceremony crafted for each couple by a celebrant that gets to know them well and ensures that their script and vows reflect precisely who they are and the commitment they are making to each other." Rev Norman Smith, convener of the Mission and Discipleship Council, said the Church of Scotland's wedding services were also personal and denied the type of ceremony was a factor in divorce rates. "There are many factors in marriage that affect divorce rates, including age, socio-economic status, children, and whether partners have been married before. "Without understanding many of the variable factors affecting divorcing couples, any suggestion of causation between type of ceremony and divorce rate is entirely spurious." A spokesman for the Catholic Bishops' Conference of Scotland claimed the "fatal flaw" in the statistics was that Humanist weddings had not been around long enough to draw meaningful conclusions. He said: "The average length of marriages in Scotland is around 30 years. Humanist marriages have been available for around 13 years. It will be at least 17 years before we can determine whether humanist marriages last any longer than religious marriages. "Clearly the Catholic Church and the Church of Scotland have been marrying couples throughout living memory, between them they have married hundreds of thousands of Scots. "The Humanists by comparison have married around 30,000 Scots, an extremely small pool of potential divorcees compared with the churches and a statistically insignificant dataset upon which to base any meaningful conclusions."